In his lab at MIT, biological engineer Christopher Voigt has modified bacteria in agar to act like the light-sensitive silver halide crystals in gelatin emulsion on photographic film. He has hacked a harmless strain of Escherichia coli so that it produces black pigment when left in darkness or remains transparent when exposed to red light. He and his team modified the E. coli by adding 2 proteins from blue-green algae that recognize the red light and turn off the gene that makes the black color. 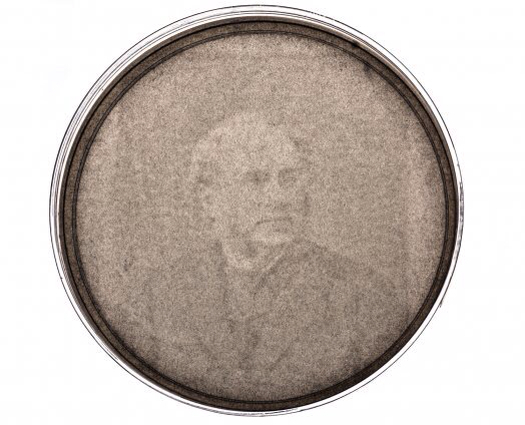 The image is obtained by shining the red light through a printed transparency taped to the bottom of the petri dish. The process takes a few days, but the photo will last up to 3 years in a refrigerator (DIY INSTRUCTIONS HERE). The image above is not Voigt's self-portrait, but a portrait of American scientist Edward L. Youmans (1821-1887), the founder of Popular Sciencet who was, ironically, visually impaired most of his life.